Closing out 2017 with spare funds? Planning your 2018 budget? 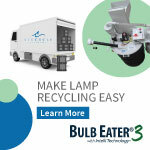 Air Cycle offers simple sustainable solutions including the renowned Bulb Eater machines, EasyPak recycling boxes, as well as nationwide Bulk Pick-up services.